Oracle SOA interview questions are provided here to crack any technical interview. The main topics the interviewer will focus in Interviewing 3 years experience candidate in Oracle SOA are XML topics, Mediator, Human Task, BPEL Activities, Meta Data Storage (MDS), Adapters (File, FTP, Database, JMS), Performance Tuning, Deployment and Testing. If you have faced any tough questions in any Oracle SOA interview, please comment in the box below. Oracle SOA Interview Questions given below are the questions that I have faced in many interviews. 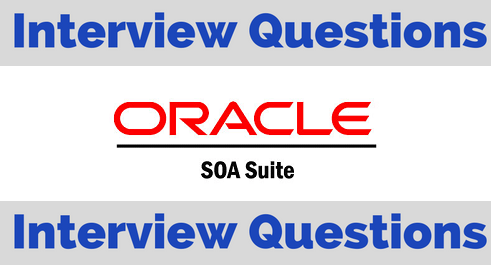 These are very common and most expected Oracle SOA Interview Questions. Along with Oracle SOA Interview Questions, the interviewer also asked me questions on OSB. If you are attending any of the Oracle SOA Interview, then prepare a few basic concepts of OSB as well. It will be helpful in creating a good impression. What are the BPEL activities that are frequently used in your current project? What is the difference between synchronous and asynchronous BPEL process? How to set audit level for BPEL? What is BPEL dehydration store? What is resequencing in Mediator? What is Domain Value Mapping(DVM)? What is the difference between static routing and dynamic routing? What are the types in Static Routing? How many adapters that you have worked within your Project and Explain? What is the difference between File and FTP adapter? How Exceptions are handled in your Project and Explain? What are the standard faults in BPEL and Mediator? How many ways to handle error/fault in BPEL? How to assign owners to the Human Task? What are the different participant types in Human Task? How to set deadlines to Human Task? What is the difference between Abstract WSDL and Concrete WSDL? What are the different errors/ exceptions that you have faced in your project? What are the various ways to deploy an SOA project? Explain? How to capture exceptions from an Error log file?